Fresh salmon combined with bright citrus flavors and a festive burst of color will put you in a California state of mind. Heat a large sauté pan over medium high heat. Add 2 teaspoons oil and swirl to coat bottom of pan. Add mushrooms and sauté 2 minutes. Add 1 tablespoon of dry citrus marinade mix to the mushrooms and continue cooking another 3 minutes. Remove mushrooms from the pan and place in a large mixing bowl. Add the corn, onion, red pepper, cilantro, lime juice and salt to the cooked mushrooms and toss to combine. In same sauté pan, add remaining teaspoon of oil and swirl to coat pan. Sprinkle the top of each salmon filet with 1 teaspoon dry citrus marinade mix. Add salmon, seasoned side down, to hot pan and sear 1 minute. Flip over and add water to the pan. Cover and cook another 2 minutes, or until done to taste preferences. Remove from the heat and uncover. 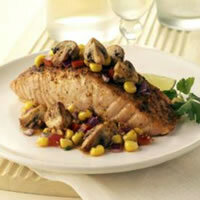 Place a spoonful of the mushroom salsa on each serving plate, top with a salmon filet. Garnish with a sprig of cilantro and a lime wedge.